I wrote this song because I saw a double rainbow and it made me really happy. I tried to put that happiness into this song! This is a nice introduction for counting items. Try it next time you read a book to your students. When you see, for example, a flower in a book ask them, " how many flowers do you see?" Lyrics, Video, Flash cards how to teach and coloring sheets to go with this song below! Click here to download How Many Rainbows? How to teach the song: You can start out by introducing the vocabulary with the flash cards above. You can also review the colors in the song by showing the color flash cards. If possible, show the video to your students. At this point just ask them to watch the video, and see what language they pick up. Can they see the two rainbows? Next, teach the phrase, " How many rainbows do you see?" by using the above flash cards or game cards. Then simply sing the song. I clap my hands, like the video, during the "how many rainbows do you see?" part. 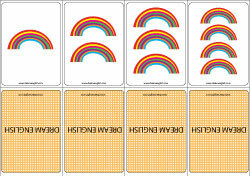 For the, " I see one, two rainbows" I point to the picture card with two rainbows. During, "across the sky" we wave our hands through the air like a rainbow across the sky. The children will most likely start singing along right away. You can pre-teach the "across the sky" part, but you will be surprised how easily they sing this part, becauase it is so repetative. Game ideas: You can play a few games with the game cards you can print above. I have been playing a game where I put one set of the game cards on a table, or the floor. I ask the students to ask me, "how many rainbows do you see?" and I answer, " I see two rainbows" then the first student to touch that card wins. If it is a bigger group, and younger kids, you can have them ask you the question one by one, and one at a time they try to find the card. Matching is very easy and fun. You will need two sets of cards for this. Put the cards on the table upside down so they can not see the rainbows, and mix the cards. The students have to find 2 matching cards. When they pick up the cards they should say, " I see 2 rainbows" or how many are on the cards. The student with the most matches wins.